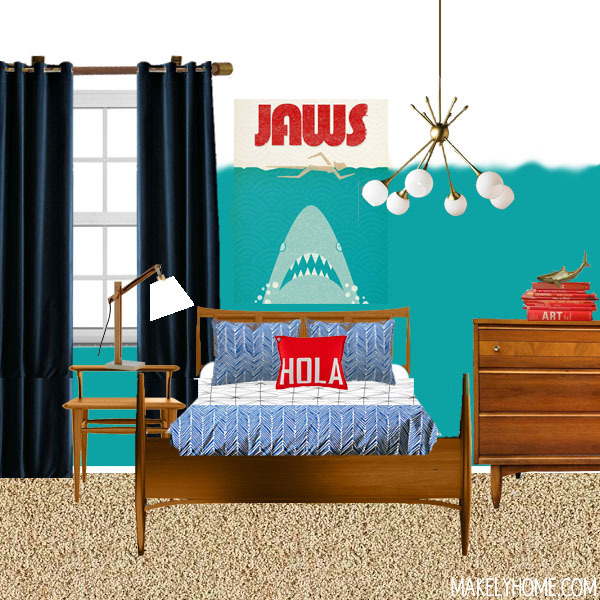 Well over a year ago, I came up with the game plan to transition my then 8-year old son’s room from a little boys room to one more fit for the confident, brilliant, and creative young man that he’s become. He was excited for us to get started on it, but then life got in the way (as it has been doing for the last few years). And then he turned 9. And then he was mere months away from turning 10. And then it was REALLY time to get started, because I was embarrassed at my lack to time management, if nothing else. So one day last month, I decided that it was time for the massive paint job to begin. I emptied the room, taped off the trim, laid down the drop cloth, and somehow convinced Tom to help me with the paint sprayer. We primed all of the walls and ceiling and then painted the ceiling and top half of the walls Lindsay White. This is what it looked like – pretty and pristine on the top and full on hot mess on the bottom. And Tom was all, “Good luck!” Ok, thanks. 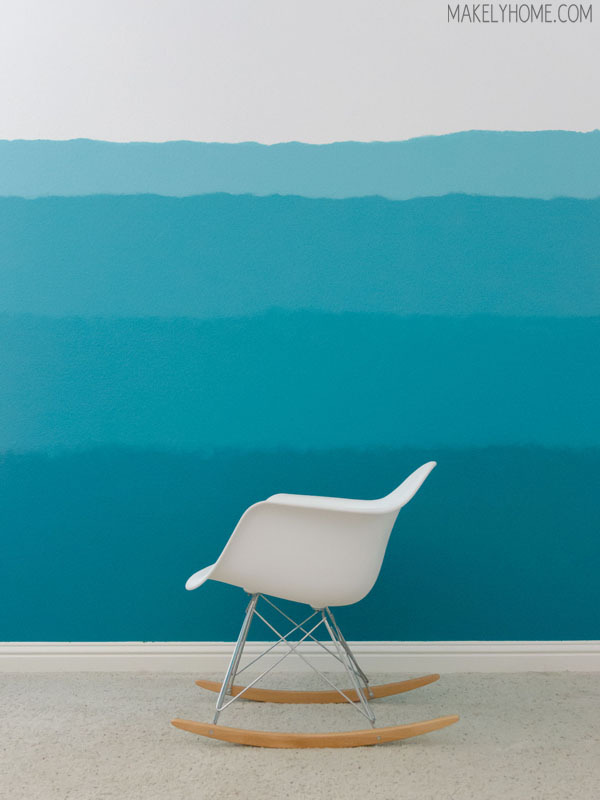 In an effort to give Zack’s room an ocean feel (without being theme-y), I wanted to paint an ombre wall – starting with dark blue at the bottom and transitioning to white at the top. Instead of it being a graduated, seamless ombre, I wanted a more modern, choppy feel. 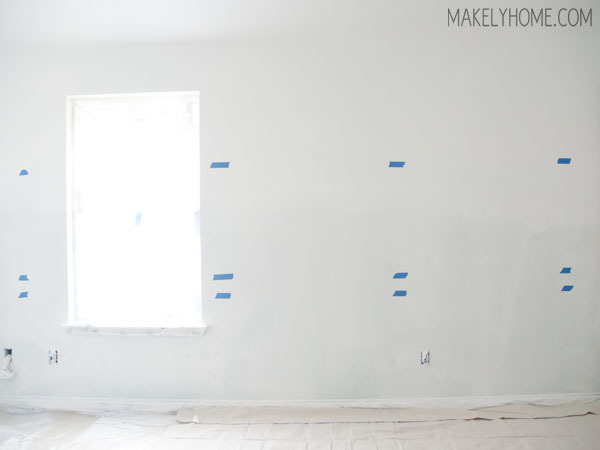 So, I divided the wall into three sections – dark blue, medium blue, and white – and marked them with painters tape. I left a six inch gap between the two blues so I would have a space to blend the colors. I was going to blend the white and light blue, but I didn’t need to leave a gap since the white was already painted, if that makes sense. Probably not. Then, I painted the middle section with Glidden’s Paint + Primer (flat) in Marine Blue. I (obviously) didn’t worry about painting sharp lines, because I’ll be blending the colors together. 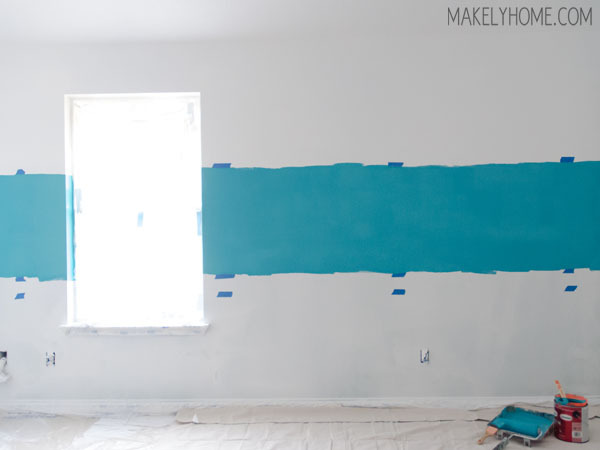 I just used my paint roller to slap the paint on the wall. Then, I painted the bottom section with Glidden’s Paint + Primer (flat) in Deep Pool. Again, I didn’t concern myself at all with the lines being straight. 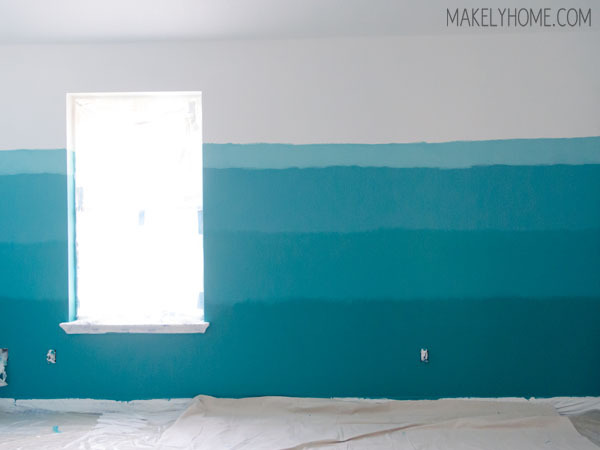 I mixed 2 cups of Marine Blue with 2 cups of Deep pool in an empty paint can. 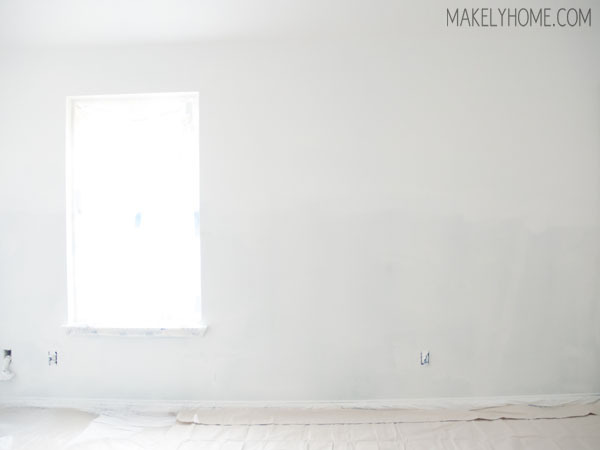 I used that new mixture and a paint brush to paint the section I left white. I only painted a few feet at a time and then used a dry brush to blend the wet paint into the other two painted sections. And I wasn’t jazzed. I didn’t really like this look at all. So, I kept working with it. I used a sponge to apply some of the Deep Pool to the bottom of the middle section and some of the Marine Blue to the top of the middle section. I liked that result much better. The lesson here is that it’s just paint, so keep playing around until you get the look you want. 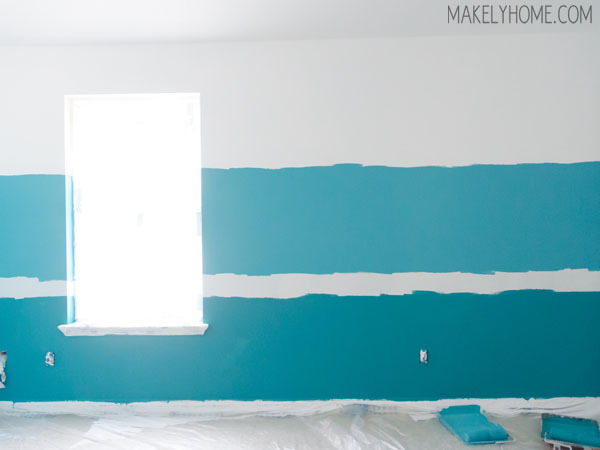 Next, I mixed 2 cups of Marine Blue with 2 cups of Lindsay White and painted the top stripe. I paid a little more attention to what the top line looked like this time since I wanted it to look like a horizon line, but I didn’t want it to be perfectly sharp and straight. I laugh in the face of perfection. With my sponge, I added some Marine Blue to the bottom of the newest stripe. Because the big difference in color between the white and medium blue, it didn’t blend as nicely as the other section. But you know what? I am totally okay with that. In fact, I think it looks a little like layered, torn paper, and I’m happy about that. Once I cleaned up the drop cloths and reinstalled my outlet covers, the wall looked like this. 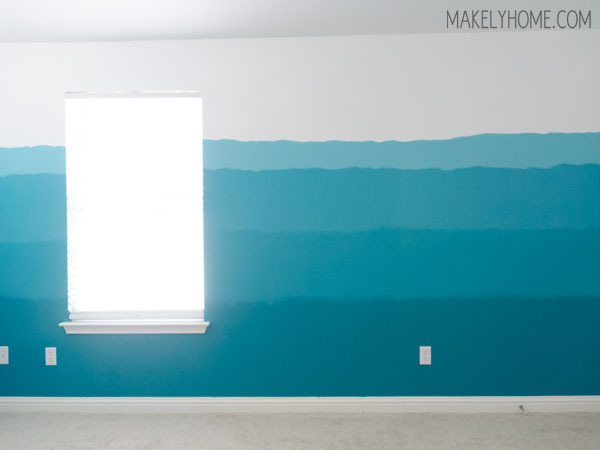 I painted two of Zack’s adjacent walls with this ombre effect. 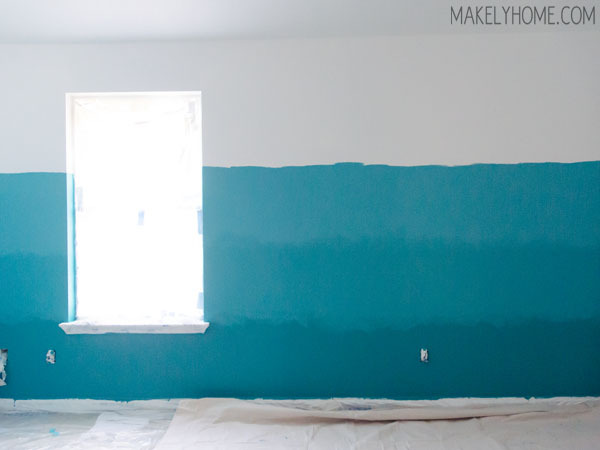 The other two walls are painted in Marine Blue. He is thrilled, and he can’t wait to see how the rest of the room is going to turn out. Me, too. I guess I better get working on that. AWESOME!! He is one lucky kid to be getting that kind of a paint job on his room! I can’t wait to see the rest! !